Glover in "Rubin and Ed"
For a few years in the early 1990s, I did movie reviews twice a week at Salt Lake City radio station KALL 910, one of the last of the full-service format AM stations. Most of that time I was on the air with midday host Peter Boam ("Peter B" on the air, great guy off the air), but remained after Peter was unable to renew his contract and spent some time with host Hans Petersen. 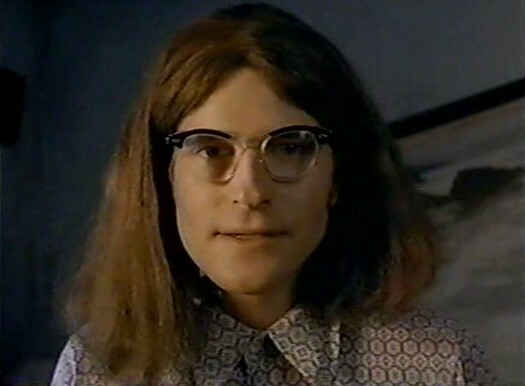 SALT LAKE CITY -- The news was both exciting and ominous: Crispin Glover would be joining me in the KALL radio studios for a live interview. Exciting because Glover is one of those rare, genuinely original actors who delivers unexpected performances in films on a consistent basis -- Marty McFly's geeky dad in "Back to the Future," a teen speed freak covering up a murder in "River's Edge," Andy Warhol in "The Doors," a cockroach-obsessed wacko in "Wild at Heart," to name a few. With Glover, you never know what you're going to get. Which brings us to ominous: He has an unsettling reputation for giving interviews that turn ugly and stay that way. Glover frightened David Letterman sufficiently enough to get himself ejected from "Late Night with David Letterman" after nearly kicking the host's face (Glover returned, somewhat calmer, a week later). He stuttered and giggled his way through the "Tonight Show" a time or two and has transformed the occasional radio interview, conducted by ignorant and unsuspecting hosts, into Painful Radio Listening. Hans Petersen, KALL's afternoon show master of ceremonies, seemed oblivious to my fears. "But Hans," I kept saying, nervously and over and over, "Glover has been very strange on every interview I've seen. I don't know if it's an act, or what, but this could be something we'll regret." What I failed to realize, of course, is that every show Hans does is odd, and so he looked at me, maybe with pity, and just smiled. Then, in walked Glover, and in his wake Trent Harris, who directed "Rubin and Ed," the film the two men were there to talk about. I know what I was suspecting, and somehow Glover didn't live up -- or down -- to it. He was dressed in an old-fashioned three-piece suit, his hair trimmed to a fashionable length and he was very polite, very normal. The interview began, and the only hint of strangeness was Glover's habit of twisting his bangs in front of his eyes, bringing the hair to a point on his chin. But this was radio, so it wasn't a put-on for the audience. Harris, who shot the film in Salt Lake City and other Utah locales, summed up "Rubin and Ed" very succinctly: "It's a twisted tale about success, toupees and a frozen cat badly in need of a burial." Glover, 28, plays Rubin, a shy man who agrees to accompany Ed (Howard Hesseman) to a real estate seminar on the condition that they find a proper burial site for his cat. Eventually, Rubin, Ed and the rapidly thawing cat are wandering through Utah's vast desert, looking for just the right spot. Funny thing is, much of the plot is based in fact. Harris has had friends who have frozen their pets until they had the time to bury them. "I had a girlfriend with a three-legged Irish setter that we also had to put in the freezer," Harris said. Then Glover, who had attended a "Rubin and Ed" screening at the Tower Theatre the night before, chimed in: "Somebody came up to me at the show last night and said they had done the exact same thing." "With a cat?" Harris asked. "Yeah," Glover responded. "It's common." "My sister did it with a hamster," Harris recalled. "So there are probably literally thousands of people listening to this right now with pets in their freezer." Somehow, it fit. There I was, Crispin Glover to my left, and we were talking about dead pets on ice, live on the radio. Even so, Glover had shattered my expectations. In the journalism business, you spend time trying to drive preconceived notions and bias from your thoughts -- to better arrive at some objectivity. I had not been able to do this with Glover; I knew he was odd. Knew it. Yet there he was, describing his average romantic desires: "I wish I had a girlfriend I was going steady with. I've just got to find the right girl. I'm sure I will." And it's not like he isn't aware that other people -- mostly people who don't know him -- think he's from another planet. He was open about attempting to look at his own persona with some objectivity: "It's not like I have intellectually set out a manifesto saying, 'OK, I'm going to approach something that people won't understand,' " he explained. "I always do something that I think, 'This really makes sense. This is how it has to be.' "
"A lot of people think Crispin's a pretty strange character," Harris said. "But I've known him now probably more than 10 years, and I don't think Crispin's odd at all, on a lot of levels. I think he's basically an honest person, a hard-working person. He's a good friend, he's loyal. All of those traits that people consider normal, Crispin is all of those things." And another journalist's assumptions are flushed down the toilet. This blog is for my kids, so they'll know what Dad was up to when they were too young to care (not that they do now ... but someday, maybe).